Bring your street or race-prepared car to our ICSCC-approved driving event. It is fundamental for those interested in racing, yet also fun education for those who want to learn more about car control on the street or just practice their skills. Our Driving School includes a four-hour evening classroom session with in-depth instruc­tion on car control theory and driving techniques. The next day you will put your knowledge to work on the 2-mile road course at world famous Portland International Raceway. 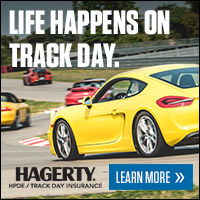 You'll have a full day of on-track instruction and camaraderie with fellow car/racing enthusiasts. For those interested in simply honing their driving skills, our HPDE course is a full day of on-track sessions around P.I.R. An instructor will ride along first session. OW—There is now the opportunity for Open-wheel/Sports Racers to get on-track before the race weekend starts. We have added a 15-20 min. single OW session at the end of the driver training day. Contact Cascade Tracy Klein for MSR discount code to enter on the online payment page. Ensure the positive terminal on the battery is properly covered. The battery needs to be mechanically secured to the car. The helmet requirement is Snell SA2000 or Snell M2000, or newer.